The Halo Universe Comes to Life this Summer. From your console to your city – experience what it’s like to step into the world of Halo. Immersive themed attractions will let you to explore the world of Halo like never before. Visit a Halo Ring, get up close and personal with a real-life Warthog, battle fellow recruits in an epic laser tag arena, experience thrilling in-universe encounters with the latest simulation technologies, and much more. Halo: Outpost Discovery is as epic as the beloved science fiction franchise itself, featuring more than 300,000 sq. feet of themed attractions, immersive experiences, community engagement opportunities, interactive panels, gameplay, a bustling marketplace, and more. Take advantage of hundreds of game stations to play, compete, and explore the Halo game library. Attend one of our many themed panels and learn how the Halo universe is made. Or take part in one of the many available community events to learn how to stream, build a cosplay costume, or even design your own video game. 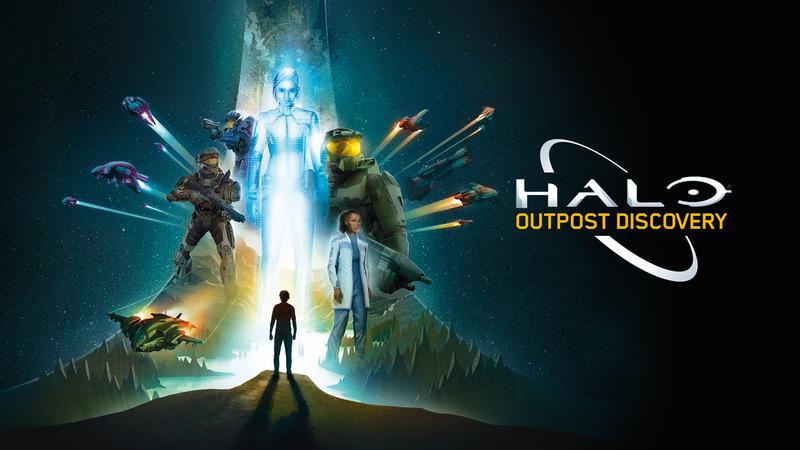 Whether you’re a Halo veteran or brand new to the franchise, Halo: Outpost Discovery offers experiences designed with everyone in mind. From deep dives into the Halo backstory and interactive museum attractions, to hands-on gameplay and unique, exclusive shopping opportunities. This first of its kind, authentic experience is guaranteed to delight the whole family. Bring your friends and squad up. $5 off each ticket when you purchase 4-10 tickets for the same day in one transaction. Want to experience Halo with your children? One (1) child, 6 years of age or under is free with a paying adult. Whether you purchase your ticket in advance or buy on-site, the child will need to be present at the badge pick-up location to receive their wristband for access. Halo: Outpost Discovery welcomes fans of all ages. Those under the age of 18, must be accompanied by an adult, unless at the discretion of the parent/legal guardian. Halo: Outpost Discovery will not be held responsible for any children under the age of 18. Cancellation Policy: All sales are final. No refunds or exchanges. Upgrades are not available. All Tickets/Badges are non-transferable. Tickets/Badges for each event cannot be resold. Unauthorized attempts to resell Tickets/Badges will result in forfeiture without a refund. Ticket/Badge holders assume all risk incidental to participation in all activities, loss or damage to property and release management, its employees and agents against any claims. By purchasing a Ticket/Badge and attending any event(s) to Halo: Outpost Discovery, Ticket/Badge holders have consented to the following policies (made available in the FAQ section on the Halo: Outpost Discovery website at www.halooutpostdiscovery.com): (1) RECORDING POLICY (2) WEAPONS & PROPS POLICY (3) VIOLENCE & HARASSMENT POLICY (4) COSPLAY POLICY and (5) OTHER POLICIES. Holder also hereby: (1) releases Herschend Live, LLC and Microsoft Corporation from any liability for loss or damage to persons or property, infringement of any right or any other claim or course of action of any kind; (2) authorizes and permits Herschend Live, LLC and Microsoft Corporation and their designees which include but are not limited to all sponsors, exhibitors and contractors to use and authorize the use of his/her name, voice, likeness and all reproductions thereof by any means and in all media now and hereafter know for all purposes worldwide in perpetuity; and (3) agrees to comply with all rules and regulations of the event. Holder agrees not to make any recordings of any kind at designated activities without the express written permission of Herschend Live, LLC and Microsoft Corporation. We reserve the right to deny entry or remove from the Event facilities any person who in our sole and absolute discretion is behaving or threatening to behave in a manner which we reasonably consider to be disruptive of the Event. Tickets/Badges for the event are non-refundable and non-transferable and cannot be reproduced, resold or upgraded. The unauthorized resale or attempted resale of the Ticket/Badge is prohibited and will constitute a forfeiture of the Ticket/Badge without compensation. Each Ticket/Badge must be used by the same person for each day of the Event. The Event’s operating hours, schedules, guests and speakers are subject to change or cancellation without notice. Each Ticket/Badge is a revocable license to attend the Event. All panels, autographing, photo ops, special events, show features and performances are subject to availability and access is not guaranteed and/or may require an additional fee. Herschend Live is not responsible for lost or stolen Tickets/Badges. The Attendee acknowledges there are hazards and risks of physical injury or illness to Attendees of the Event and that not all such hazards or risks can be fully eliminated. By accepting this Badge and attending the Event, the Attendee freely and voluntarily agrees to assume the full risk of bodily injury or property damage, regardless of severity, or death that Attendee may sustain as a result of attending the Event, whether or not caused by the negligence or gross negligence of Herschend Live.